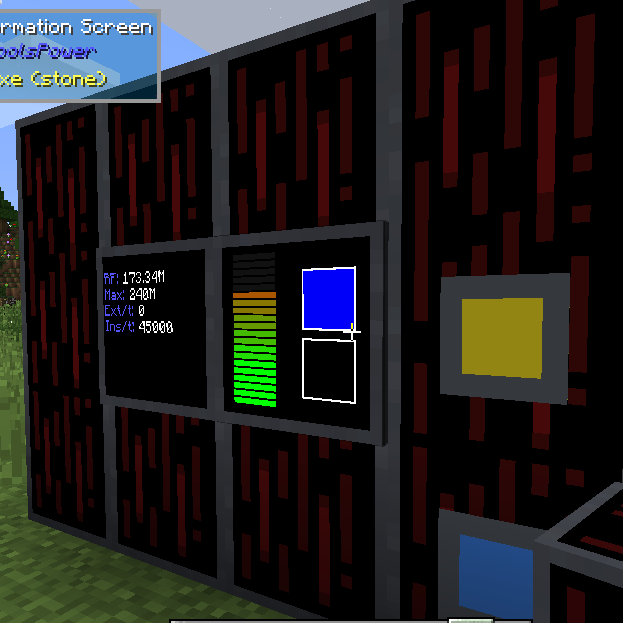 This mod is a (currently standalone) RFTools addon which will in the future contain all power storage and power generator blocks from RFTools. So the endergenic, coal generator and powercells will be moved here. At the moment this mod only contains a new multi-block power storage for very big power storage. In contrast with the power cells that are currently in RFTools this block provides more storage but the advantage of the original powercells is that they are a multidimensional and disconnected multiblock so they can be used to transfer power to other dimensions. Note! This mod does *not* require RFTools. If RFTools is present the recipes will use RFTools components (machine base, dimensional shards) but that's the only connection. Feel free to use this mod in your modpacks. This is a great idea but if it work standalone needs some kind of wrench and a simple way to detect redstone signal for the current capacity. Using these and I'm trying to figure out a way to automate a generator to start when the cell is at 50%, but comparators don't register the level. Is there anything available that can detect the level of power in these cells? You could add high-capacity low-IO cells and low-capacity high-IO cells to allow for some tradeoffs. It totally NEEDS the horizontal texture connection. And more, the full set of connected textures. You may do a bit different texture for horizontal connections unlike these borders. It just looks like separate multiblocks when it's more than 1 horizontally. If you want a different texture, stop bugging him and make it for yourself, then upload the Texture Pack (with his permission) to this site, and he might just make a config to change up the textures. Seriously why do people feel so entitled to the labor of others? To counter the complaints, I love the vertical tiling. It has a sort of Star Trek feel for some reason. Tiling the entire surface would look grotesque. this'll be fun! I kinda hope that it stays standalone though once everything is added in! You never fail to impress McJty, nice work.